I recently made these beauties for a bake sale fund raiser... and they sure turned out beautifully! 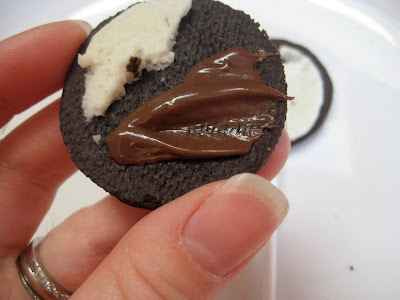 Ingredients: Oreos, self hardening chocolate, sprinkles, mini Ziploc's (to keep them fresh!) and sucker sticks. Take a cookie and 'gingerly' slide a stick inside. Sliding the stick inside with loosen the cookie halves apart with breaking the cookies. While you are opening your cookies, place you self hardening chocolate either in a double boiler or into the microwave.... I prefer the microwave. If you choose to microwave, melt your chocolate pieces 30 seconds at a time, stirring well. Also, it is important that NO water ever get inside your bowl of chocolate! 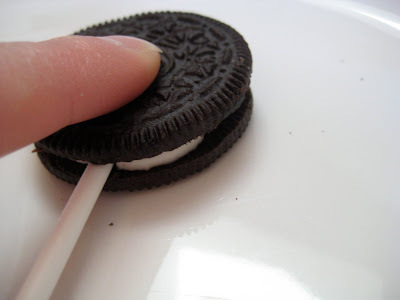 After you've dolloped a little bit of chocolate in between the cookies, add the stick, and gently squish together! 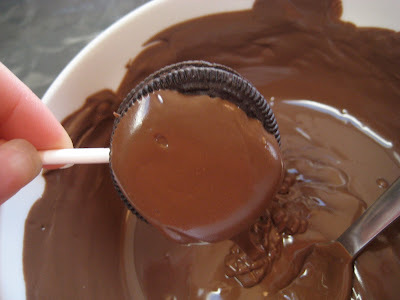 Spoon your melted chocolate over the cookie, it is really helpful to keep your chocolate hot, for the best coating! If you feel like your chocolate has begun to cool, and it doesn't drizzle over (and run off of) the cookie well anymore... reheat! Make sure to coat all of the cookie, sometimes air pockets can form along the rim of the sandwich (does it sound healthier if I call it a "sandwich?" I didn't think so!)! Rinse and repeat... and then WOW those who are lucky enough to enjoy these with you! YUM! Yum! My children would love these. I have only have the worst of luck trying to melt chocolate though. Steveie and anyone else: for best results, make sure you are using fresh, candy-making, chocolate. You'll find that stuff at stores that sell cake-making supplies. I've seen these made before but never with the stick idea...love it. They would be perfect for fundraisers etc. Thanks for the idea! These sandwiches look awesome! I've got to try them. Did you figure how to take the calories out?? LOL! Yep, I lick them off before I eat the chocolate goodness!!! Try it! My daughter's birthday is next week and I wanted to find a fun, easy treat for us to make together to pass out to her friends. Thanks for sharing this - it's perfect! These are so easy and so pretty, the party girls will LOVE them! 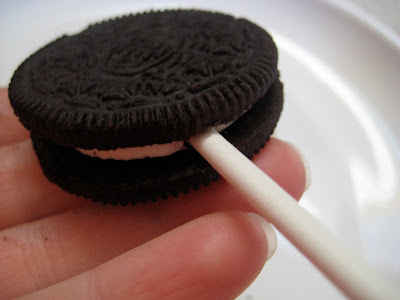 Plus, standard Oreos are peanut free, just in case a party attendee has allergies! 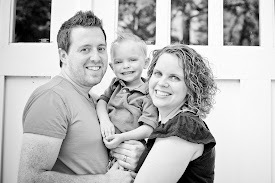 national and debt, someone with financial troubles is definitely part with the norm.